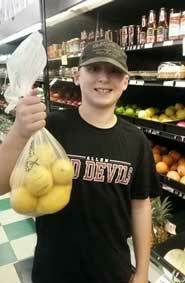 Wylie Young stocks up on lemons for his Hurricane Harvey benefit. A young man in Overbrook is doing what he can to help animals displaced by Hurricane Harvey. Wylie Young, 11, is setting up a lemonade stand this Saturday and Sunday, Sept. 2 and 3, 2017, at his house, 304 Walnut, Overbrook, Kan. All proceeds will go to San Antonio Animal Care Services in Texas. Everyone is invited to stop by and have a cool glass of lemonade and help animals at the same time. Wylie loves all animals, especially dogs and wolves. He has actively participated in the 4-H pet project in Osage County for 5 years.